Ethan Hawke in "Good Kill"
Trailer: "Good Kill" explores the trials and tribulations of drone warfare. There will be more Tommy Egans. That's what filmmaker Andrew Niccol and actor Ethan Hawke, who plays a fighter jock reassigned as a drone pilot, want audiences to remember from their film "Good Kill" as the U.S. continues to debate the ethics of drone warfare. Hawke and Niccol were featured guests at the film's Washington, D.C., premiere Tuesday and a followup Q&A event moderated by MSNBC personality Chris Matthews. The background: Hawke plays Maj. Tom Egan, whose goal is to redeem the career he once had as an F-16 fighter pilot. Having amassed 3,000 hours in that aircraft, comprising six combat tours and 200 combat sorties, a frustrated Egan watches "real planes" sit on the flightline as he works with members of the 61st Attack Squadron in "some trailers outside of Vegas," taking controversial orders from the CIA via speakerphone. Each remote "good kill" by a drone drains just a bit more purpose from Egan, to the point where he questions if he's an airman obeying orders, or just a merciless killer. If the film gets one thematic element right (as opposed to such faux pas on technical details as Egan pining for the days when he could land his F-16 on aircraft carriers — whoops), it's the drone pilot "disconnect" that resonates within the military community. "No one's throwing a pity party for us, so just keep compartmentalizing," says Egan's squadron commander, Lt. Col. Jack Johns (Bruce Greenwood). Not the most profound advice, but Egan takes it. The pity party bit for what the Air Force prefers to call the remotely piloted aircraft, or RPA, community isn't totally off. "They aren't pilots," one Air Force Times reader wrote in December in response to a story about some RPA airmen noticing a cultural shift that has become more accepting of their line of work. "They want a special medal for doing their job? In my time we were content with doing a good job and maybe a thank you." Another reader simply wrote, "No. No they are not." And while some see a shift towards greater acceptance, others say they still feel mainly pushback. One unmanned aircraft pilot told Air Force Times in January that they are treated like the Air Force "stepchild." "Many in the community feel like it's in a sort of perpetual crisis mode, and further feel like the service leadership has let them down by having crisis mode drag on for years with no end in sight," retired Lt. Col. Tony Carr, the man behind the popular blog John Q. Public, told Air Force Times in April. "No one can predict the future, but the sense I get is that retaining much of anyone is going to be impossible without a change in the resource equation," Carr said. And the Air Force continues to wrestle with the ripple effects of RPA airmen feeling like second-class pilots in the midst of a shortage in that growing field. With roughly 1,200 Air Force pilots flying RPAs, "the biggest problem is training," Gen. Mark Welsh, the service's chief of staff, told reporters Jan. 15. "We can only train about 180 people a year and we need 300 a year trained — and we're losing about 240 from the community each year. Training 180 and losing 240 is not a winning proposition for us." The film makes the point that RPA strikes are "where the action's at" — but not without a cost. "I feel just as confused as the people who have to make those decisions," Hawke told Military Times in January. "For the public to have an opinion, they have to have some knowledge about what these men and women are going through, because the service members can't speak for themselves — they have their duties to do." 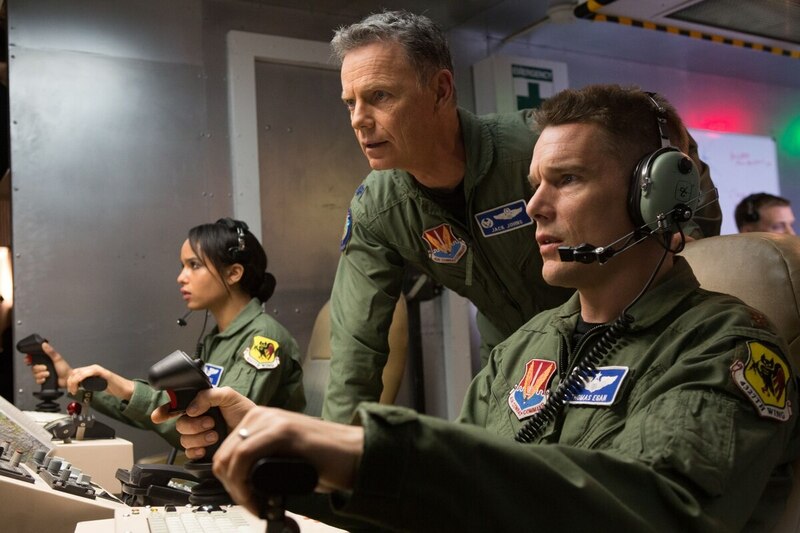 "Good Kill" opens in select theaters this weekend, and nationwide May 22. And in case you missed it, check out the full Military Times interview with Ethan Hawke here.